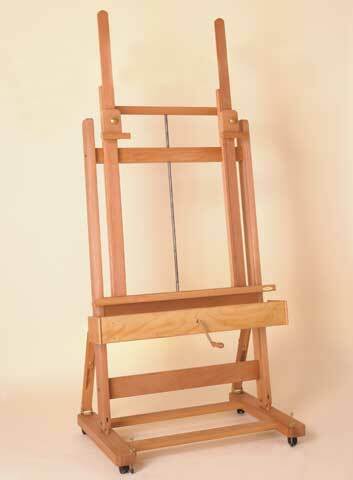 This artist’s easel is constructed of beautifully oiled, stain-resistant beechwood. For convenience, the canvas holder height is adjusted by a crank mechanism. This feature is especially handy when working with large canvases. The working angle is adjustable and there are two extendable center poles for stable use with canvases up to 92-1/2". The poles and canvas are locked in the desired position by tightening a screw in the rear. The sturdy base is supported by four casters and leveling bolts.